We were inseparable. Our minds started melding together to the point that we found ourselves dressing alike without even planning it. At one point we discovered that our voices sounded so alike over the phone that our own parents couldn’t tell the difference! She came into my life at a most crucial time and helped me find my way back into the arms of God. She was the best friend anyone could ever ask for. As we grew, things changed. I saw a great change in her as she distanced herself from some amazing girls we hung out with at school as well as me. It hurt deeply. After many months of brushing me off with no explanation, she mentioned some things I had done that bothered her. Apparently we both had changed, but in my heart it was never enough to shut out the best friend I had ever known. I was hurt for years over this broken friendship. I was hurt because there was never an explanation—just ignored calls and emails. I had no idea what was going on. I was hurt because she viewed something I had said very much differently than I intended, and nothing I could say so far after the fact could ever open her eyes. The friendship was over, and it was a painful time for me. Have you experienced a lost friendship that you thought would last forever? I’m not talking about a boyfriend because in the teen world, whether you would like to admit it or not, boyfriends will come and go. It is the best friend who will stay until the end, right? She’s the one you cry to when one of the boyfriends decide it’s time to go. She’s the one who says something that no one else gets, but you do. She’s the one who laughs at the first word out of your mouth knowing exactly what words are about to follow. That type of friendship is supposed to be lasting. Right? 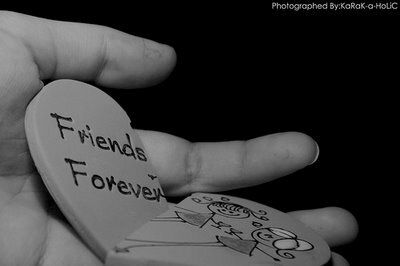 It’s so difficult to lose a friendship that you hold so dear to you, but unfortunately it happens. The younger you are, the more likely it is that your friendship will eventually be nonexistent because as you grow and mature, your friend will too, and you don’t always grow in the same direction. It literally took me years to get past the hurt from losing someone who was as close to me as a sister. It truly felt like losing a family member. God used that time to really speak to me about friendships, and it helped me snap out of the “pity party” I was having for myself. At some point I stumbled upon this poem written by an unknown author. This poem, for me, explained it all. After really delving into the Word and understanding that God places people in our paths for a purpose but sometimes only for a certain time (or season), I realized the painful truth of my friendship with this sweet girl. Her presence in my life was just for a season, and I was so blessed that God allowed us a lengthy one. She brought me back to him and taught me how to be a better person than the one she met that first day. Through her words and actions concerning a certain boy, I saw what true love and adoration looked like. I think we automatically assume the friendships we have right now will be forever, but God’s plan may be different from our own. Understand that the friendships you have today may be gone tomorrow and cherish them as if it were your last day together. Fit Friday Issue 4 – SECRET REVEALED: This Diet is 100% Effective! I can certainly agree that people do come into our lives for a reason, season and a lifetime. And as a guy, from the outside looking in, I always see woman who truly understand each other. Women by nature, are nurturers… there is nothing like the love of a woman. Whether it’s your mom, a sister, a best friend, or (for the guys out there) a wife… there is just nothing like the love and friendship of a woman. And when that is broken, I can only imagine.. (keyword imagine) how that would feel. As a guy, I can’t directly relate but I can sympathize and understand why it would hurt so much. Oh how I love this! So true with myself and my girls! Can’t wait to read this with them tonight as I help them navigate girl relationships! I love that you’re reading it with your girls! How special, and what an honor that I get to indirectly be a part of that special time for you!